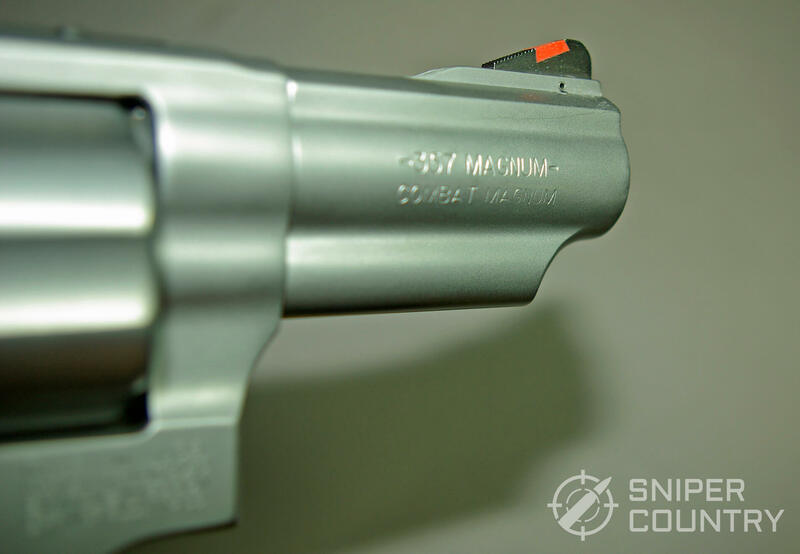 The .357 Magnum cartridge is, arguably, the most popular all-around revolver cartridge out there. 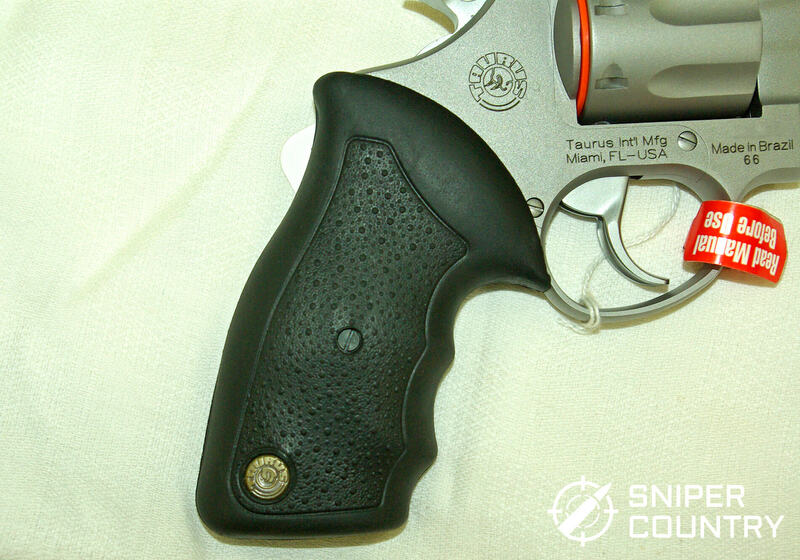 Whether you are carrying a snubby for protection or a larger gun for target shooting, competition, hiking, or other activity, the .357 seems to be the go-to round for wheelgunners. With the availability of many different loads and bullets, the cartridge is viable for most uses. Another plus works in the favor of those of us who reload – this cartridge is one of the most easily-reloaded ones out there. Bullets abound, whether store-bought or homemade. When you add in the myriad .38 Special loads that you can shoot in your .357, the choices are almost limitless in terms of loads designed for specific purposes. In the 1930s, gangs of bad guys and gals were roaming the countryside robbing banks and generally creating mayhem. What was unique about this period in American history is that the automobile’s rise in popularity and affordability meant that it had become the getaway vehicle of choice which made robbers mobile and hard to stop. The service revolver of the time, usually a four-inch .38 Special with a roundnose lead bullet at around 800 fps just wasn’t cutting it. 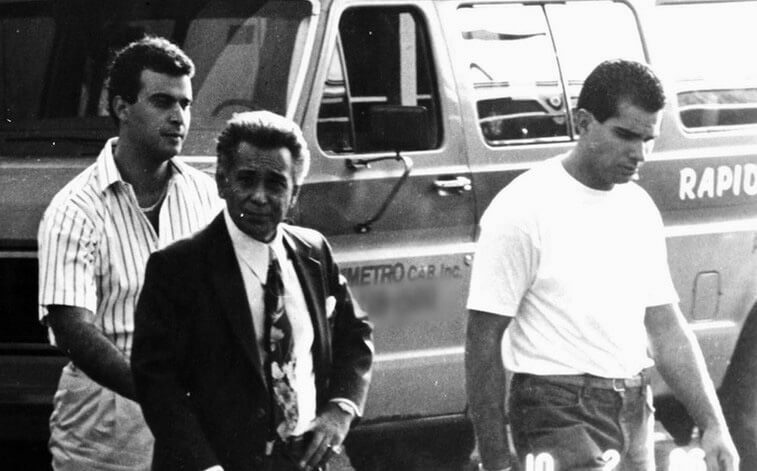 Sometimes the only way to stop a gang was to shoot into their automobile and hope to disable the driver. The old .38 couldn’t do that reliably. Colt had introduced a lengthened .38 Auto cartridge in 1929 called the .38 Super. This was the first cartridge approaching magnum-like velocities that was made for a semiautomatic pistol. Improved ballistics and a FMJ roundnose bullet was better at getting through thin sheet metal and glass, but remember that the revolver was still the gun of choice for law officers. Noted gun writer and hunter Elmer Keith had been experimenting with heavy .38 loads using a large, .44-sized frame gun chambered in .38 called the Smith and Wesson .38-44 Heavy Duty. Even with the higher velocities gained with this combination, more was wanted. So Elmer Keith, Phil Sharpe of the NRA Technical Staff and Smith and Wesson vice president Dan B. Wesson got together and created what became known as the .357 Magnum. 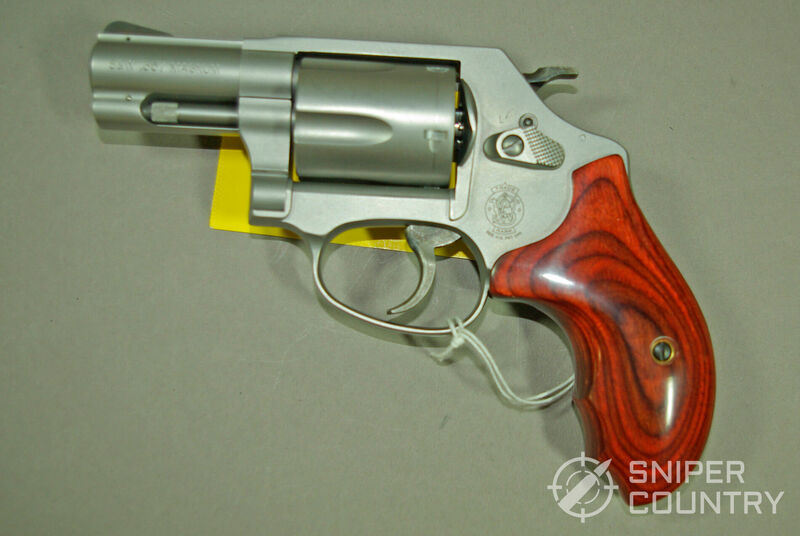 It was based on a .38 Special case lengthened 1/10” to prevent it being chambered in a .38 Special revolver. With the powders and bullets available in 1934, they were able to get a 158-grain lead bullet close to 1500 fps out of an 8-inch-plus barrel. This proved to be a very effective cartridge. 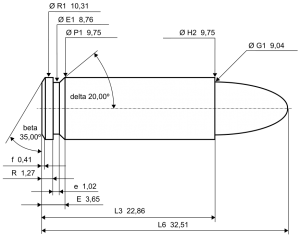 They tinkered with it for a while, and in 1935 introduced it to the world as the “.357 Magnum.” There was nothing magical about the numbers 3-5-7…that was the bullet diameter the cartridge used. The original Smith and Wesson .357 revolver was called the “Registered Magnum” and came with its own certificate of authenticity. They were available in barrel lengths from 3.5” to 8.75”. Each gun was, pretty much, a custom order. In 1939 Smith and Wesson standardized the gun in order to make it easier to produce, calling it simply the “357 Magnum” with barrel lengths of 3.5, 5, 6.5 and 8.75 inches. Eventually the gun became the Model 27. The 3.5-inch barreled version was very popular. Many F.B.I. agents carried it, as did General George S. Patton. He called the one he carried with its custom ivory grip panels engraved with his initials his “killing gun.” In 1954, the Model 28 (the “Highway Patrolman”) was introduced which was nothing more than a watered-down Model 27 devoid of expensive hand polishing, engraving, etc. I owned a four-inch Model 28 many years ago and wish I still had it. 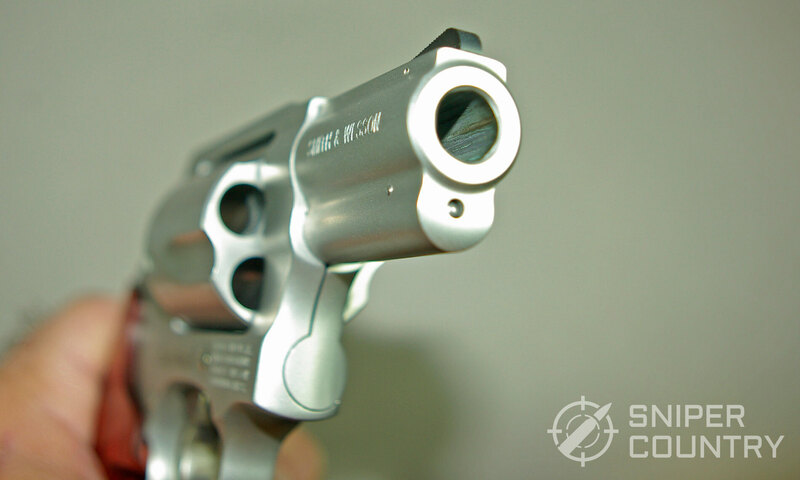 To this day, the .357 guns that Smith and Wesson make are among their best-sellers. Even from the Depression-era days of the Registered Magnum, they couldn’t keep up with demand. They were backlogged with orders for the four years they produced the Registered Magnum and the caliber’s popularity continues to this day. The original Model 27 is no longer in mass production but is now included in Smith and Wesson’s “Classic” line of revolvers available at extra cost. When the caliber was first introduced, Phil Sharpe among others went world-wide, taking game animals of all sizes with it. The long-barreled revolver, standardized at 8 ⅜”, produced some very impressive velocities which allowed it to kill animals that up to that point had not been taken with a handgun. It was about at this time that the hype and the legend of the .357 began appearing. We have to remember that this caliber was the most powerful revolver load at that time. The gun was described as a man’s-man type of gun that you had better wear gloves to shoot. However, those savvy shooters who owned this beast would shoot .38 Specials in it at least part of the time. That accomplished two purposes: it let the shooter shoot a lot more than if he or she were shooting full-bore .357 loads and it saved wear & tear on the gun, enabling it to last longer. One must remember that sometimes a revolver that shoots only full-power magnum loads needs to go back to the factory for adjustment more often than one that shoots a mixture of light and heavy rounds. In my personal experience, I have owned or still own .357 revolvers. As mentioned above, my first one was the Model 28 with a four-inch barrel. That barrel length is fairly typical of .357 barrels, and is carried by a lot of people for various purposes. Another .357 I wish I’d kept was a Dan Wesson 15-2 with interchangeable barrels. 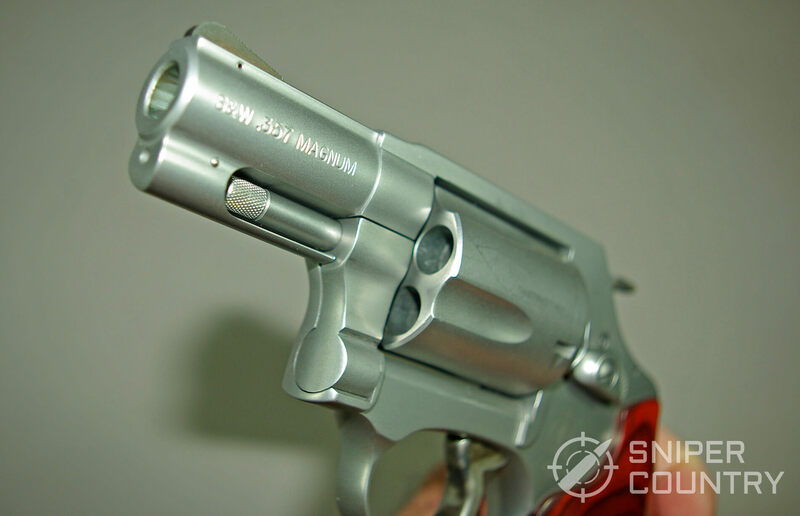 This was the original Dan Wesson, made in New England, which unfortunately went out of business until the brand was revived a few years ago, a very good thing. It was made in .44 Magnum, also. This .357 consisted of a frame and barrels held in place by a barrel nut that you removed with a special wrench. The barrel shroud came off and you literally unscrewed the barrel from the frame and replaced it with a different-length tube. I owned one 8-inch and one 2-inch barrel. Talk about versatility…the Pistol Pack that they sold had four different barrel lengths, with others available. If you bought the “suitcase”, you got barrels in 2, 4, 6 and 8 inch lengths. 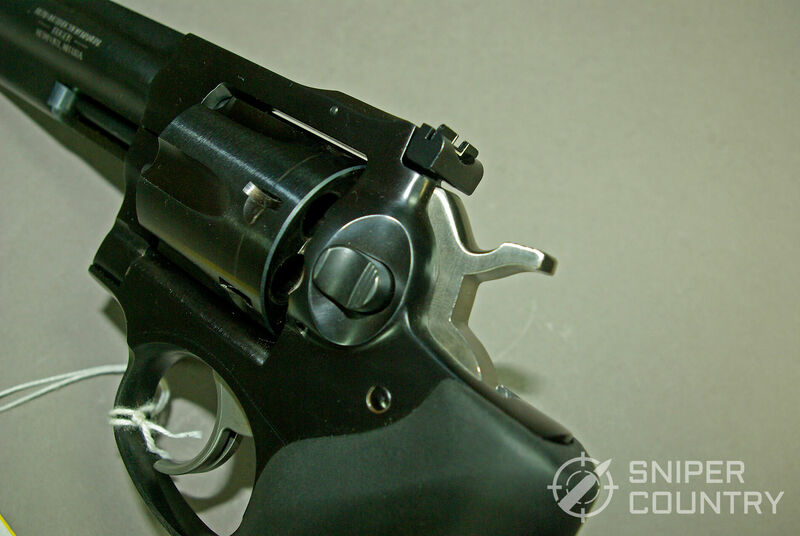 To replace the barrel, a .003″ feeler gauge was inserted between the barrel as it was screwed in and the front of the cylinder, then the front nut was tightened. That way, proper tension was applied to both the front of the barrel and the rear, with the threads holding it tightly. Because of this dual tension, the guns were very accurate. 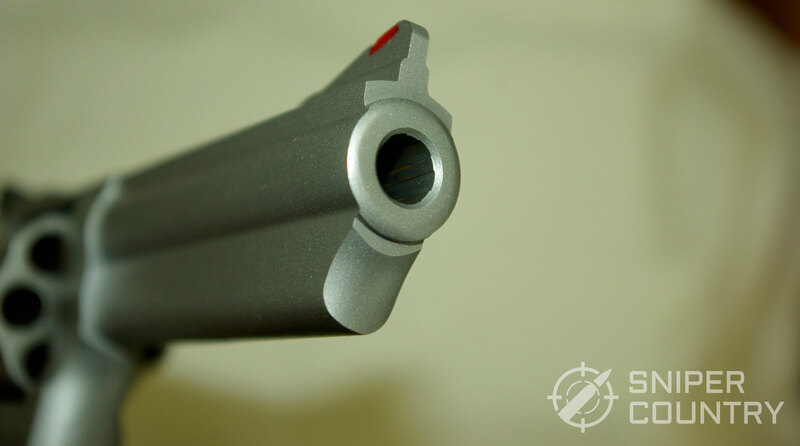 Another feature ahead of its time was that the grip was one-piece and, Ruger-like, slipped over a post and was tightened from the bottom with a set screw. A fully-adjustable rear sight made the gun suitable for hunting, target shooting, or silhouette shooting. The gun was a marvel of engineering. If I could afford it, I’d buy the new one just for old time’s sake, not to mention the practical aspect of having four guns in one. Fast-forward to today – the gun I own now is a six-inch-barreled Rossi .357. There is a difference between those two barrel lengths in terms of recoil and muzzle blast. The shorter tube is harder on the shooter in both categories. I remember vividly 39 years ago buying the Model 28 and a box of Smith and Wesson-branded 110-grain JHP ammo. That’s all I could find at the store. The thing with the lighter-than-average 110-grain bullets in the .357 Magnum is that they are usually loaded to higher velocities than heavier, 158-grain bullets. This is true for just about every caliber-lighter bullets can be pushed faster, on average, than heavier ones within the pressure envelope. This higher velocity translated into increased muzzle blast in that four-inch fire-breather. I had forgotten my hearing protection (of course) but decided to go ahead and sight it in by shooting most of that box of ammo. It took one ear two days to open up and four for the other one. I can only imagine the permanent damage I did to my hearing. There are two morals of this story… the first one is that hearing protection should ALWAYS be worn, along with eye protection. This is obvious, or should be. 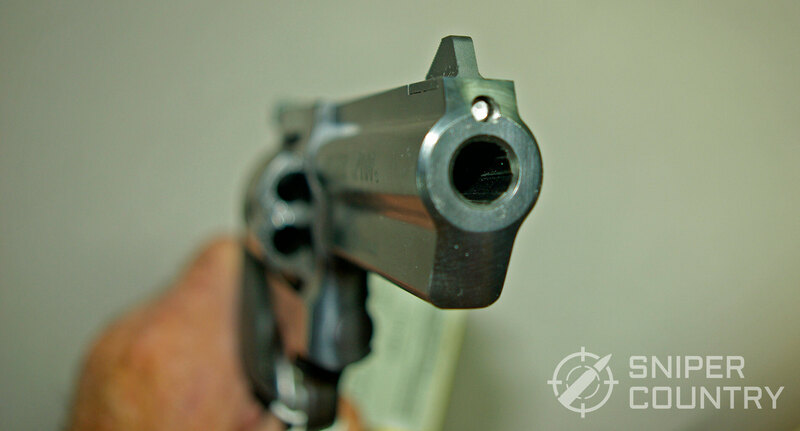 The second moral of the story is that four-inch .357s are very loud with full-tilt loads and you should plan accordingly in terms of the gear you take to the range. All I can say in my defense was that I was extremely anxious to get that gun sighted in. Looking back, I surely wouldn’t do that again! I hope I have gained some “shooting sense” over the years. And a note to the reader – don’t pull this stunt. Once hearing is lost, it’s gone for good, for the most part. Always protect your ears and eyes, especially with a round like the .357 Magnum. 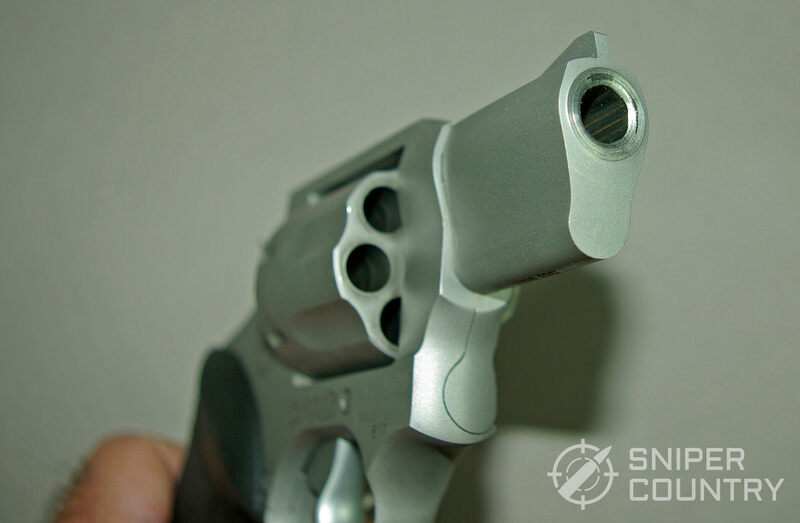 I understand that some readers may consider a four-inch-or-so barreled revolver suitable for concealed carry. I have included that barrel length in the Hunting/General Purpose category because most folks who carry concealed carry a snubby, with that line drawn at three inches or so. Personally, I would have no issue with carrying a longer-barreled gun as long as I could hide it well. This the carrier’s call and no one else’s. 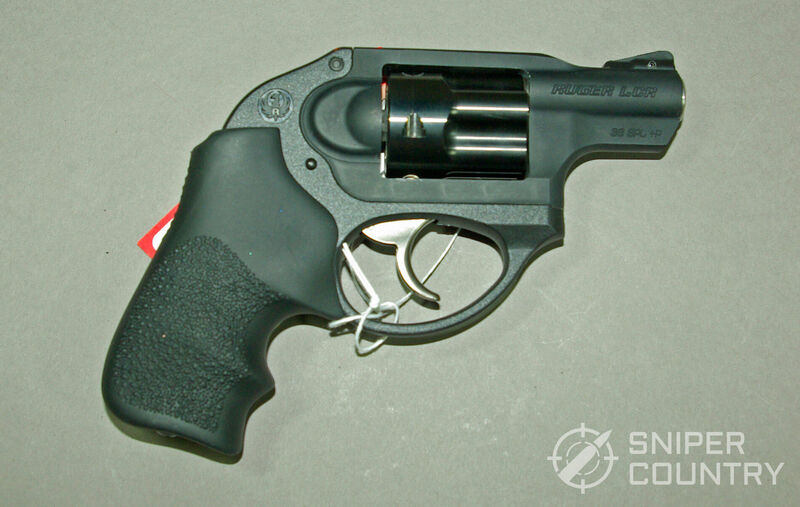 The Ruger LCR (light carry revolver) is available in .38 Special and .357 Magnum, among other calibers. I had listed this gun as a best buy in another article I wrote about the best concealed carry revolvers, only it was in .38 Special. 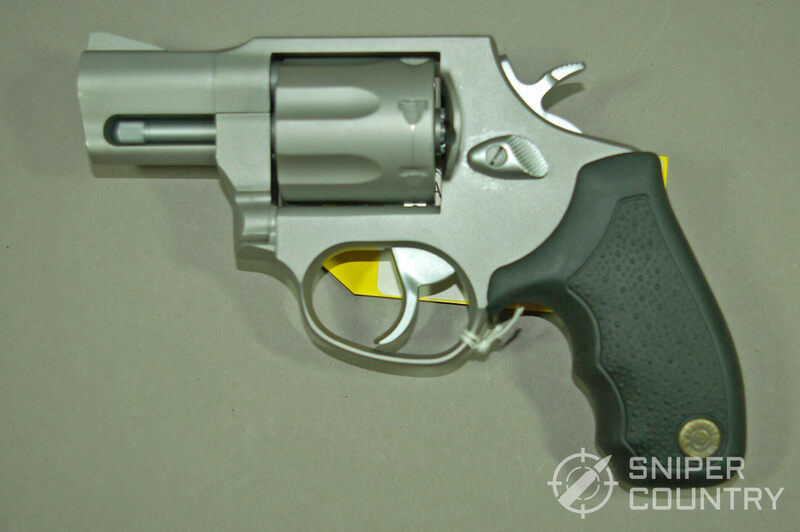 Now we will look at the same gun in its .357 Magnum version, which was released in June, 2010. 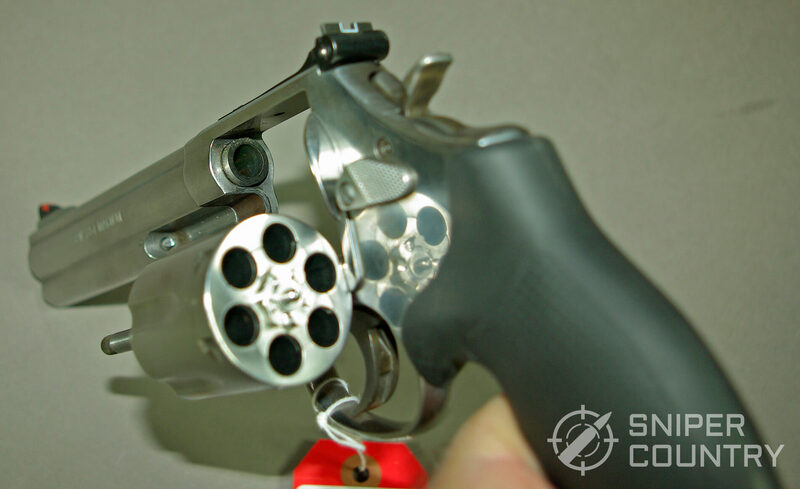 This is a very unique revolver. The grip frame is polymer, with steel used in the areas where its strength is needed. The cylinder is heavily fluted in an effort to save weight. As with any handgun, physics rules – a very light revolver that fires a very hot cartridge is going to kick like a Missouri mule. The gun, at an ounce over a pound, is one that you would stuff .38s into for practice while saving the wrist-crackers for when the gun accompanies you in its concealed carry role. At least, that’s what I would do. As stated above, it’s easier on both you and the gun. This gun has advantages and disadvantages – its size and weight work against it so the blast and recoil is fierce with full loads, but the size and weight are also an advantage. How can they be both? You can carry this gun around all day in the right holster (pocket or otherwise) and just about forget that it’s there, so size and weight work in its favor. Plus, let’s face it – just how much are you going to shoot it versus carry it? You will need to practice with your full-tilt loads, of course, but you can get by with a range session of 80% light loads and 20% or so of the barn-burners. The Ruger is a popular carry choice for those reasons. 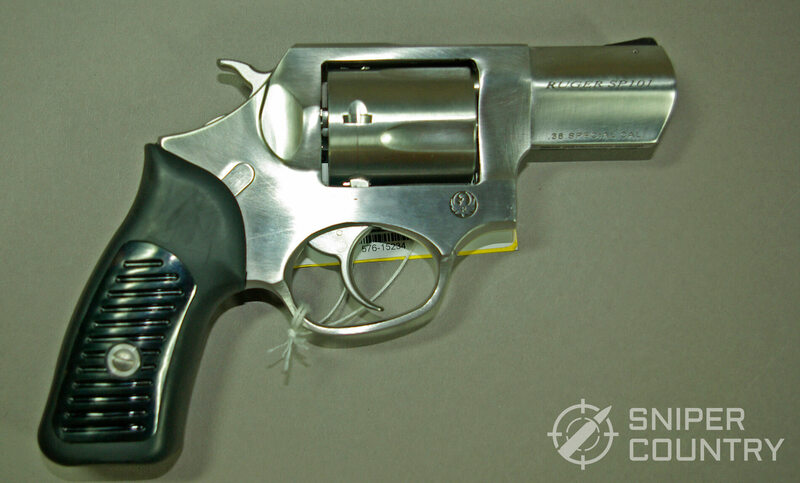 Add in Ruger’s legendary customer service and we have a very desirable, reliable revolver. 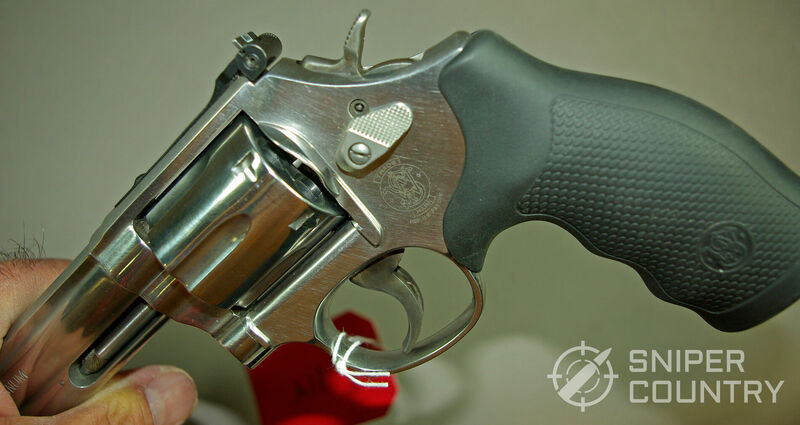 The Taurus 617 is a sleeper in terms of a solidly-built .357 at a bargain price. Similar to the Smith and Wesson 640 in size and weight but with an exposed hammer, the 617 is one tough cookie. Taurus guns have their detractors and defenders, to be sure, but I’ve owned (or still own) several. I have had a problem with just one Taurus, a 1911. This was several years ago and they fixed it. I’ve also had to send back Smith and Wesson, Ruger and Kel Tec guns – that’s just the way it goes. The new leadership at Taurus is aware of the company’s quality control issues in the past. Anyway, in the case of revolvers, Taurus has had a lot of practice. The Brazil-based company produced its first revolver in 1941. In 1971, the Bangor Punta Corp. (owners of Smith and Wesson at that time) purchased 54% of the Taurus company. An exchange of ideas, designs, etc. ensued. (That’s why some Taurus revolvers look a lot like Smith and Wesson guns). 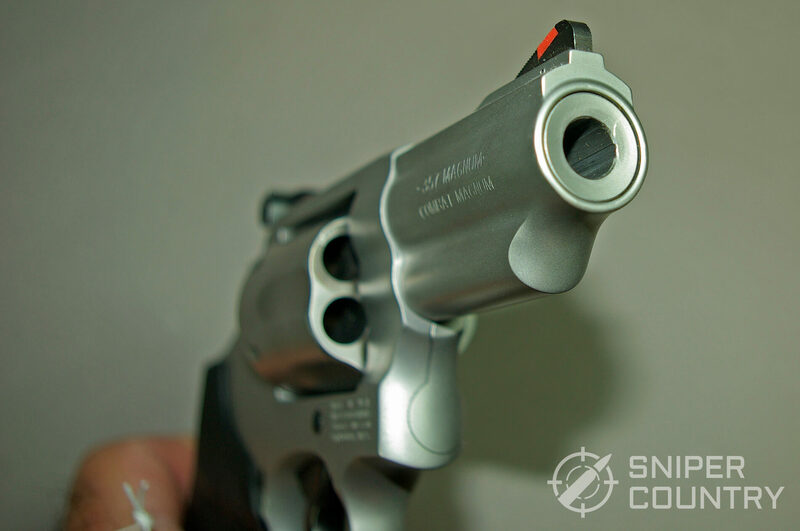 The partnership lasted until 1980 when Taurus was purchased by its current owners and the Smith and Wesson connection ended. An interesting note: Taurus bought Beretta’s Sao Paulo factory, tooling, machines, designs, etc. after Beretta finished a military contract for Brazil. 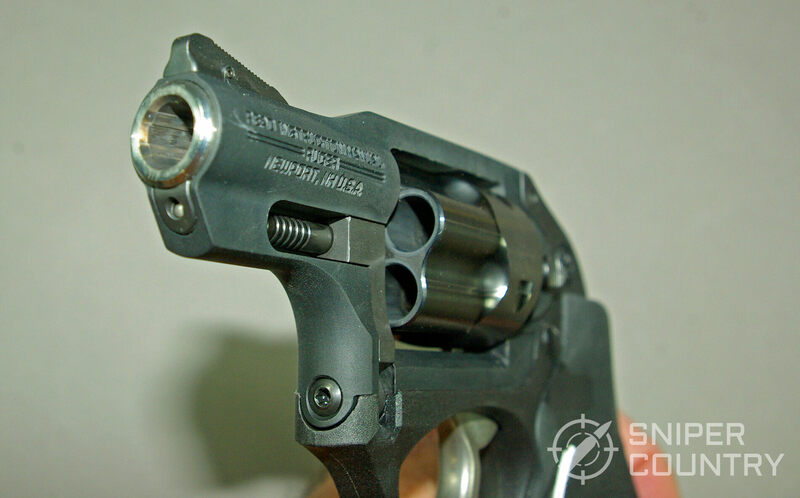 So now we know where the Taurus PT92 9mm came from – the Beretta 92FS design. 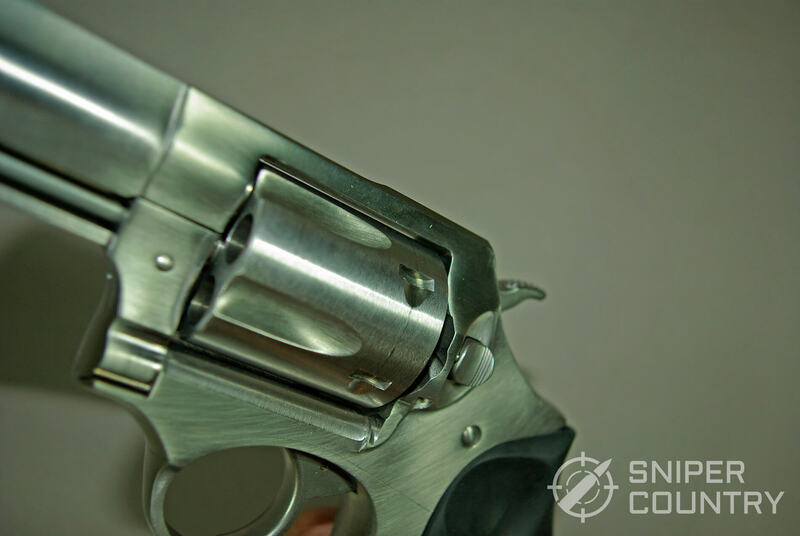 Back to the 617 – if you are looking for a concealed-carry revolver in a caliber that, when fired, gets attention on both ends of a two-inch-barreled gun, then take a look at the 617. This 7-shooter is backed by a lifetime warranty and should give years of service. 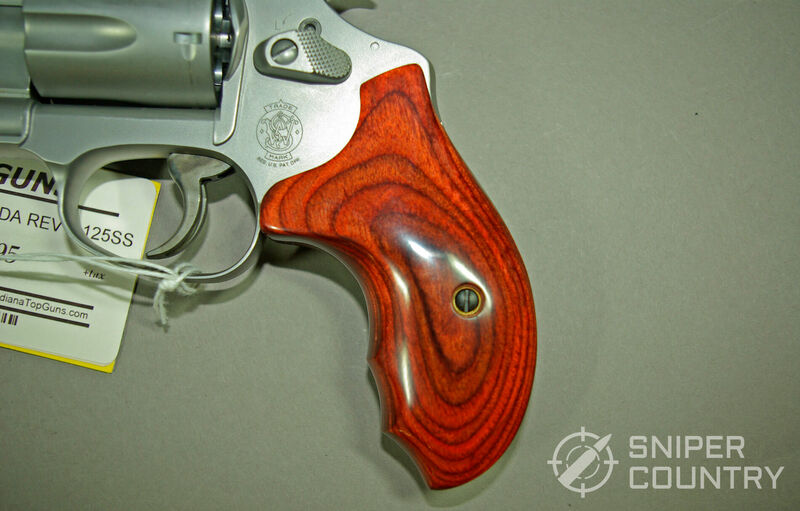 Ruger – the name that conjures up guns made of armor plate and put together with tank welds…this is an apt description of the SP101 series of guns. We’re talking about a 2.25-inch-barreled 5-shot revolver, but if you want a longer barrel, there is a three-inch version. An adjustable-rear-sight-model is also offered if that is on your needs list. The SP series is derived (along with the GP series) from Ruger’s Security Six revolvers of the 1970s. 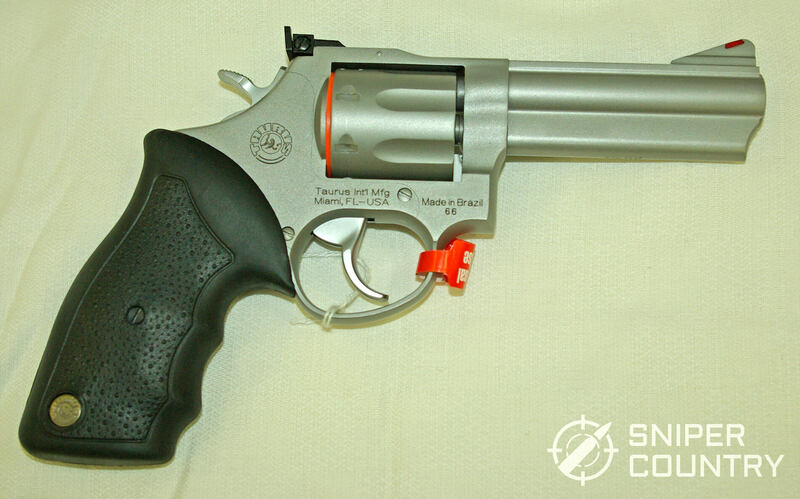 The Security Six line was the first double action wheelgun made by Ruger and they were definitely built to last. The SP101 makes an ideal gun to carry inside the waistband, or in a pocket if you have some mighty tough pockets…it weighs 1.6 pounds. The nice thing about the short-barreled SP101 is that it weighs 1.6 pounds. That weight makes shooting .357 Magnum rounds a little easier on your hand. 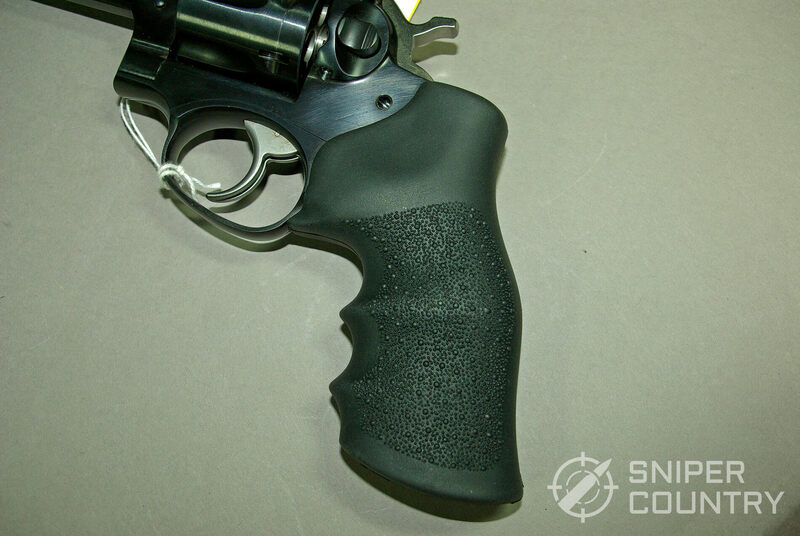 Plus, with its steel revolver grip frame, you can swap the grip panels out for something that absorbs more recoil. No matter which SP101 you get, you will have a gun that will last a lifetime, at least yours if not your grandkids’. Once upon a time, when cops carried revolvers, SP101s were to be found in deep concealment about the policeman’s body somewhere. They made excellent back-up or hideout guns. I would imagine that there are still some law enforcement officers out there somewhere that still do carry this short-barreled gun. When I pick up an SP101 of any persuasion, the word that comes to mind is “solid.” Pick one up the next time you’re standing at your local gun shop’s counter and you’ll see what I mean. The same feeling is obtained when I hold a GP100. Either of these guns deserve to be on a “best .357” list. Rugers are made for a lifetime of shooting. The Model 66 Smith and Wesson is included in two separate entries in this best-of list. Here we have a rebirth of a legendary revolver that sold like crazy when it was introduced a few decades ago. The original Model 66 was basically the stainless version of the Model 19, the K-frame .357 that famous Chief Patrol Inspector of the Border Patrol/gunfighter/writer Bill Jordan convinced Smith and Wesson to release in 1957. The N-framed Models 27 and 28 were just too much to tote around all day, so Bill had asked Smith and Wesson to produce a four-inch, K-framed .357 with a shrouded barrel and adjustable sights. He called it the “peace officer’s dream.” It was in 1970 that the stainless version, the 66, was introduced. It was discontinued in 2005. 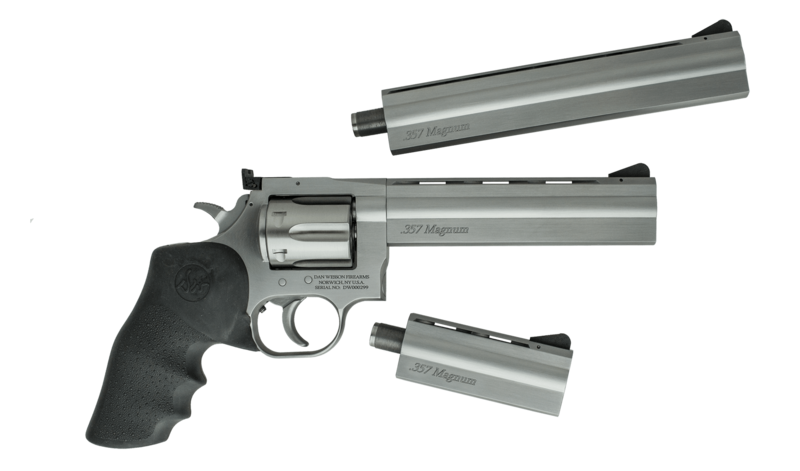 The newly-reissued stainless Combat Magnum 66 made its appearance in the 2.75”-inch version in 2017. The four-inch barreled version predated the shorty by three years, having been introduced in 2014. The short-barreled 66 makes a great carry gun. It is heavy, a touch over two pounds. It is a K-framed, 6-shot beauty with adjustable rear sight and decent grips. The new Model 66 exhibits a few changes over the older version. Some internal parts are MIM as opposed to machined and the ubiquitous keyed lock is present. An aesthetic touch – the cylinder release, trigger and hammer are black and contrasts nicely against the satin stainless finish of the rest of the gun. Most are sent out with black rubber grips, so you have a good-looking gun if you like those colors. The front sight has a red insert that helps it to stand out against the target. To me, the “feel” of the two versions is different. The older K-frame seems to somehow sit lower in my hand as opposed to the new one, but the new one points a bit more precisely for me when I do the close-your-eyes-and-point-the-gun-at-a-target test. When I open my eyes, the front sight is pretty close to whatever I’m aiming at. Not a big difference, mind you, just a little. You can tell they are two separate guns but you also can feel the similarities between them. Revolver first cousins that would be welcome in my gun safe, to be sure! We will look at the advantages/disadvantages of a slightly longer barrel on this gun a bit further down. But…that 2.75” barrel hits a sweet spot. Long enough to give you a slightly longer sight radius than most snubbies but short enough to conceal easily. This is one very nice gun, to put it mildly. 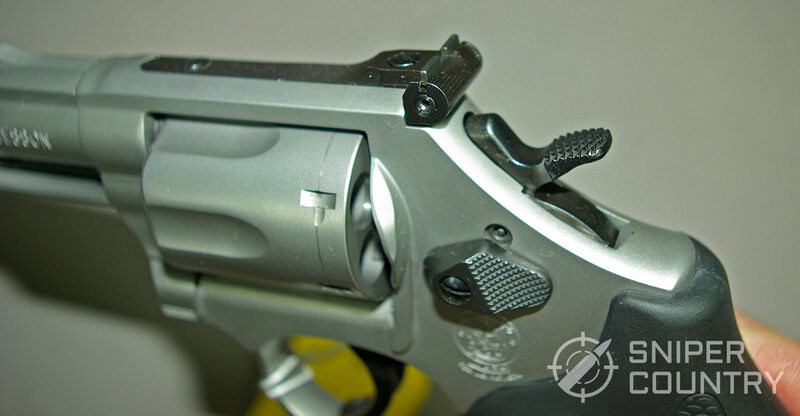 The Model 60 is a J-frame revolver. We can’t forget that. It shares most dimensions with the other Smith and Wesson J-frames except for barrel length, overall length and weight (although unless you’re comparing it to an Airweight, the weight isn’t that far off from the steel J-frame snubbies). To glance at it, you might not see its J-frame DNA. With a black, ramped front sight and an adjustable rear sight, this gun looks to most eyes like a “grown-up” Smith and Wesson. It even is available with a five-inch barrel – that certainly is different than the typical J-frame! The 2.125-inch-barreled version fits the snubby mold a little more easily than does the three- or five-inch guns. So, if you like your .357 to weigh in at only seven ounces over a pound, here’s your gun. I do believe that what sets this gun apart from the other short-barreled .357s is that it has adjustable sights. It’s like the gun couldn’t decide whether it wanted to be strictly a concealed-carry piece or a hiking/target/camping/plinking gun. With light .38 Specials, it would make a dandy plinker. Or, if you pushed the versatility of the gun to the max on your hike, you could load one or two .38 Special shotshells and put either .38 or .357 loads in the other three chambers. This is a gun that screams out “carry me anywhere.” it makes just about a perfect do-it-all gun for those uses mentioned above. I have had use for a gun like this on more than one occasion. I have had to dispatch rabid raccoons, possums, rogue dogs and various other critters around our rural home. This gun would make that task easy. So, if you are looking for a do-most-anything .357, give the three-inch Model 60 a look. You will end up with one of the most versatile guns, in one of the most versatile calibers, out there. 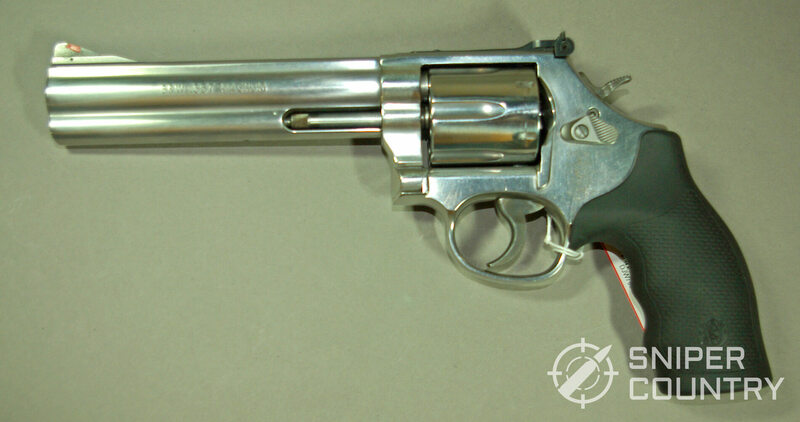 The GP-100, as mentioned above, is the direct descendant of the old Security Six revolver that Ruger introduced in 1972. That gun was Ruger’s first entry into the double-action revolver market. 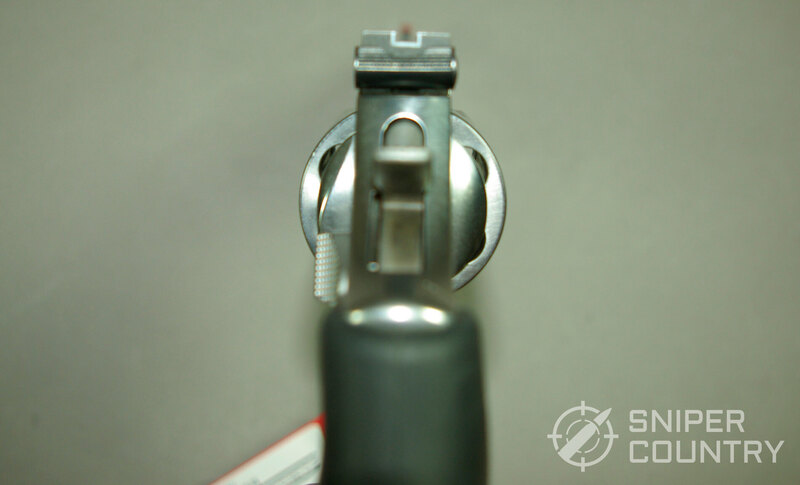 The GP-100 retained the adjustable sights that were prevalent on most of the Security Six guns, with the SP101 mostly going down the fixed-sight path similar to the Ruger Service Six. When I pick up a GP-100, I am impressed with its heft. A two-and-a-half pound gun should impress you when you pick it up, to be sure, and this one does. Shooting full-bore .357 loads from its 4.2-inch barrel isn’t exactly the proverbial piece of cake, but it sure is easier on the gun and the shooter than the same loads shot out of a gun that weighs half of what this gun weighs. There are deer hunters who use this particular gun in states where legal because it is accurate, reliable and gets the job done. What with the inch-and-a-half-wide cylinder, you tend to get more steel around each cartridge case. With that, you can shoot heavier loads. It is for that reason (plus a few more) that folks hunt with this gun. Or, if it isn’t the primary hunting arm, you will see it on the belts of those who are using a rifle or other deer gun as backup. It all depends on what’s legal in your state. In mine, I could use it as my main deer-slayer with its four-inch-plus barrel and .357 chambering. Another plus of the GP-100 is that you can change out the front sight to something more appropriate for your purpose, whatever that may be. There are several YouTube videos showing how to do it. It is something that shooters can do easily with minimal fuss and bother. 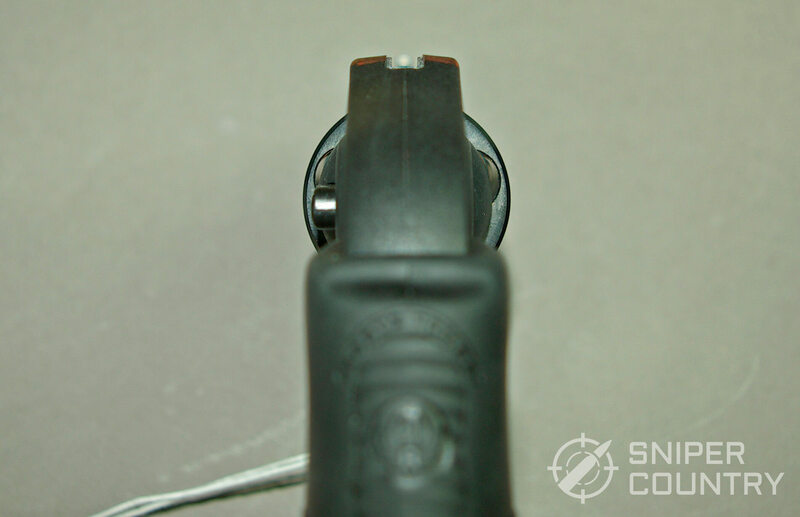 The end result is that you can custom-tailor your sight picture to one that works for you as opposed to having to put up with what comes from the factory. There are those who shoot GP-100s in competition with iron sights who appreciate the ability to swap out sight blades. 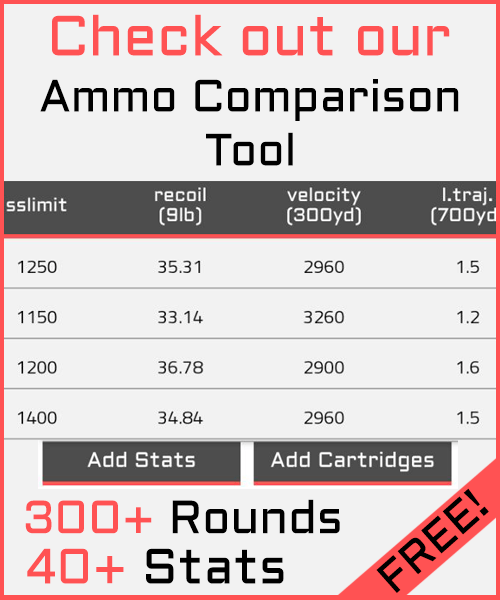 Speaking of competition, you can get a GP-100 with a match barrel for an additional cost. Unless you are big into pistol competitions, the ordinary barrel is usually accurate for most purposes. Another good thing about the GP-100 is that there are many holsters out there made for it. No matter what kind of holster you want, there is most probably one for this gun. After-market parts, different front sights, grips – the GP1-00 is a common gun with lots of stuff out there. Check one out soon. What? Single-action “cowboy guns” in an article about the best .357s of 2018? Yessir. For those of you who haven’t shot a Blackhawk variation (Super Blackhawk, regular Blackhawk, etc. ), you need to do so at your earliest opportunity. The thing with these Ruger guns is that they are built like … well, tanks. I keep using that term to describe how Rugers are put together. It is never more applicable than when discussing their single action revolvers. I’ve owned several and currently have a 5.5-inch-barreled .45 Colt with an extra .45 ACP cylinder in my gun safe. This gun has taken deer with “knock-’em-down-and-stomp-’em” loads. It is made to last. I mention my .45 Colt while we are discussing .357 guns to emphasize a point…dollar-for-dollar, I don’t think you can find a stronger, more accurate and durable gun as the Ruger Blackhawk. You tend to get way more than you pay for. Why do I list two different barrel lengths for the Blackhawk .357s? Because they perform different functions. Either gun will take game, but how they do it is what matters. Some folks like to have a short-barreled gun in a serious caliber with them for their romps in the great outdoors in order to be prepared for whatever comes their way. I heard of one fellow working for a local farmer who had a short .357 on his belt as he was checking fence and ran across a couple of deer bedded down on his farmland. It was in season – he had a legal gun with him and a permit – so he took one of the does before they headed off to parts unknown. This is a perfect example of just packing a gun along for whatever pops up. Given this farm’s location (not that far away from a decent-sized city), I could see him toting the .357 for protection from two-legged predators as well. Choosing to carry a six-inch-plus barrel reflects some thought beforehand – it is a more purpose-driven choice. This is an ideal length for hunting deer-sized game, but would also be handy (with the right reduced loads) for small game as well. Mine works very well for squirrels, for example. A .357 with a barrel length of 6 inches is very practical. This length allows you benefit from a little more velocity, plus it gets the sights a bit further apart which aids practical accuracy. The Ruger Blackhawk is a a very strong, versatile revolver. I referred to mine, a .45 Colt model with a 5.5-inch tube. As mentioned above,I have taken deer with this gun with some fairly strong Ruger-only loads, but I also realize its capability to put small game in the pot with reduced loads. 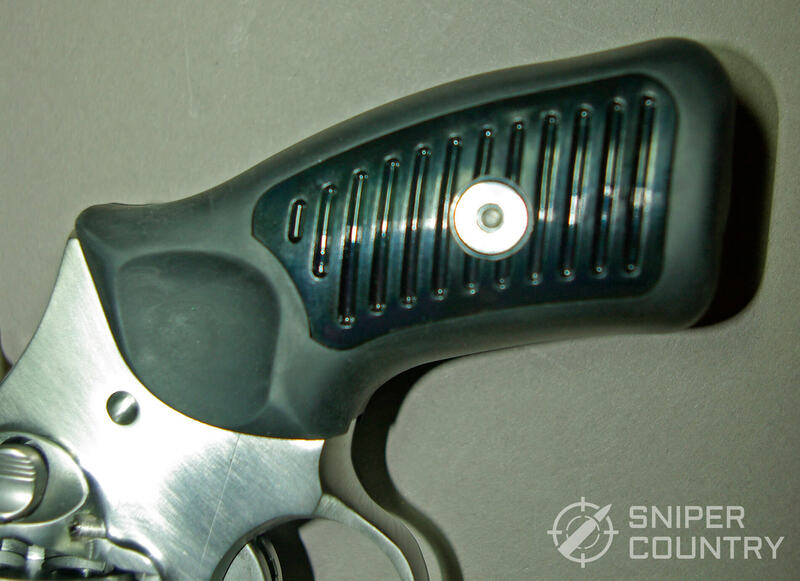 The short Ruger listed is finished in blue, with the longer-barreled model in stainless. You could get either one in both, to the best of my knowledge – I just like those finishes with those barrel lengths for some obscure aesthetic reason. 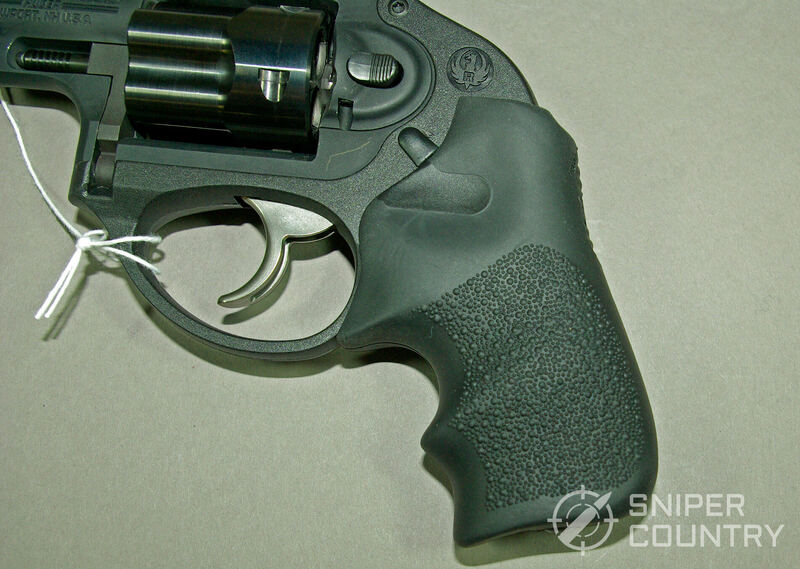 Ruger’s customer service is second to none, which is a factor that should be considered. Another reason that you might consider the .357 Blackhawk is that it has been around for a few years, to say the least. The .357 was the first centerfire caliber that Ruger built their new Blackhawk around. The year was 1955. Their single-action .22 gun was selling well, and Ruger wanted to capitalize on the cowboy/western TV show craze of the 1950s. They knew that the .357 was a perfect fit for their new cowboy-styled revolver, as people could shoot .38 Specials in it if they were simply punching holes in paper or use more serious ammo for hunting. The gun was popular from the start, and it still is. A Blackhawk .357 is one great all-around gun regardless of barrel length. Check one out if you can – you might just find yourself taking one home. The next-to-last gun in our little gathering of .357s is the Taurus Model 66 with a four-inch barrel and stainless construction. 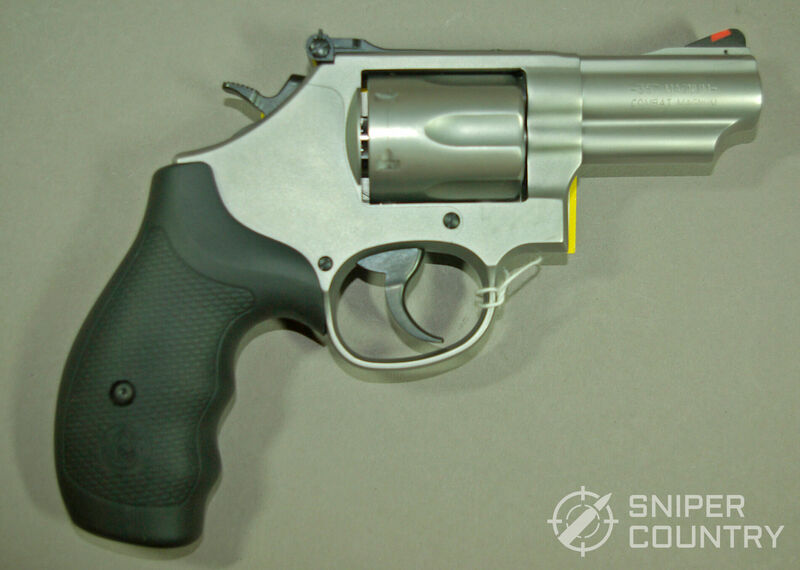 If you are familiar with revolvers, you might wonder why Taurus can make a gun that resembles, very closely, a Smith and Wesson. I explained above why some Taurus revolvers look like Smith and Wessons. The Smith and Wesson company’s connection with Taurus was a great way to introduce Smith and Wesson’s designs to South America. As Taurus’s sales went pretty much worldwide so the Smith-influenced designs did, too. The U.S. was a huge target market, as it still is for Taurus. 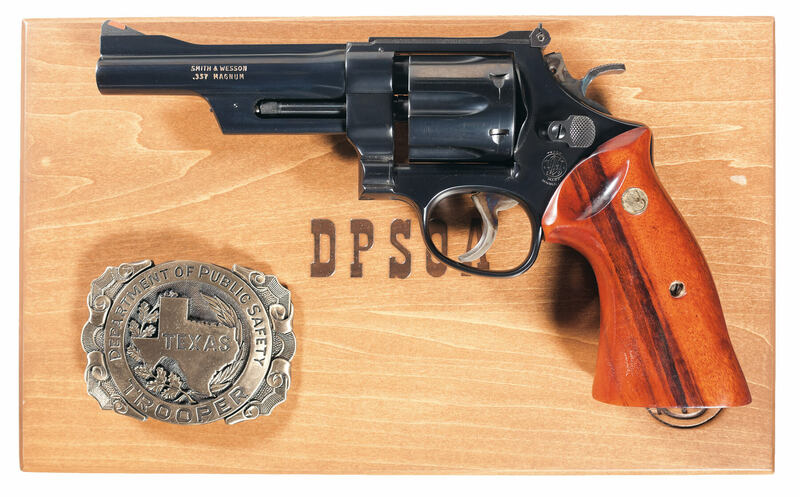 In the Model 66, we have the Taurus equivalent of the K-framed four-inch .357 that Smith and Wesson produced after being prodded by legendary gunfighter/writer/Border Patrol chief Bill Jordan (as explained above). 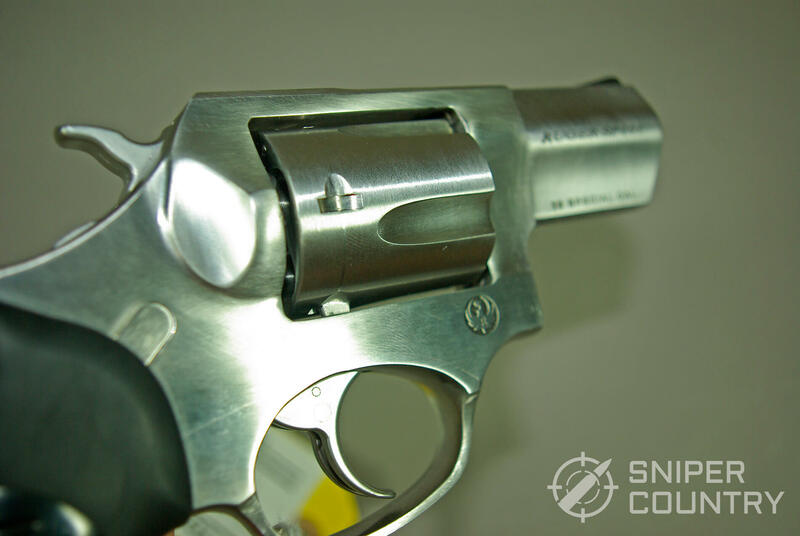 Due at least in part to his influence, the Smith and Wesson Model 19 appeared in 1955 while its stainless counterpart, the Model 66, hit the scene in 1970. 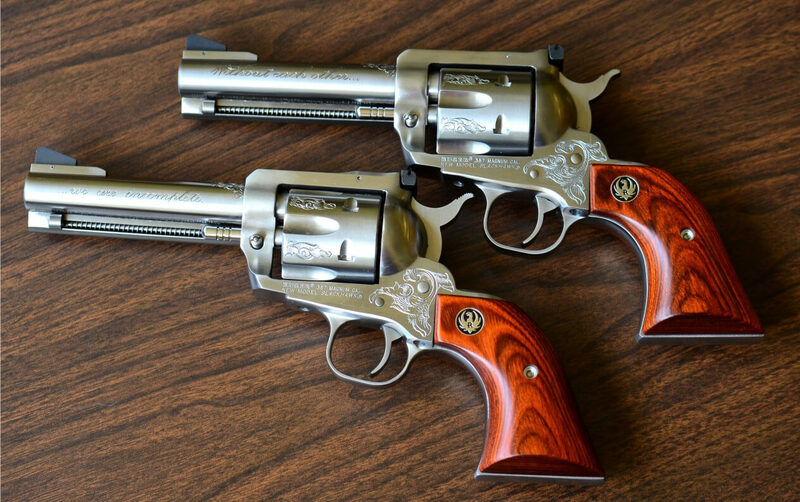 These were guns that were lighter than the other Smith and Wesson .357s available at that time, the Models 27 and 28. They were easier for policemen to carry yet still fired the potent .357 round. 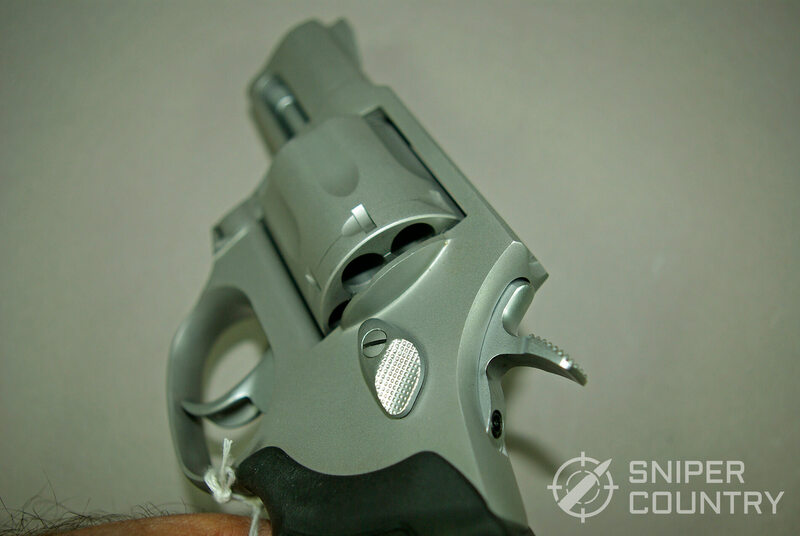 It was one year after the Model 66 was introduced (1971) that Smith and Wesson’s parent company bought and controlled Taurus, a situation which lasted until 1980. 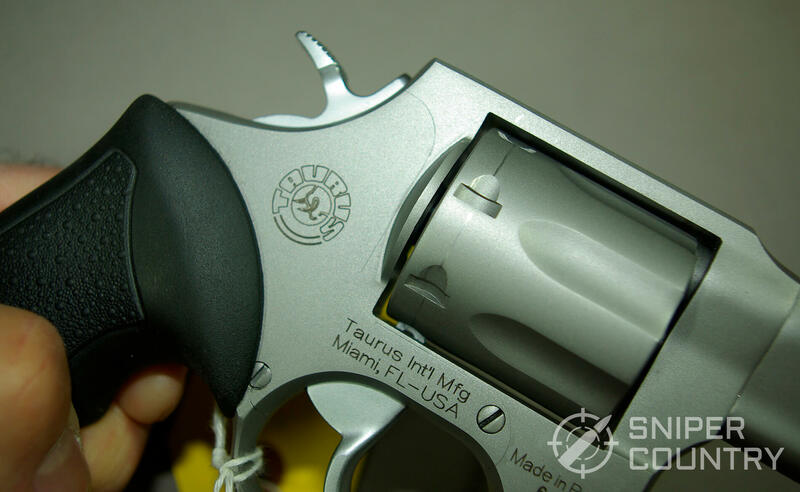 Legally, Taurus could continue building its version of Smith and Wesson revolvers, which they do to this day. The Taurus is a very decent gun for its price. I have owned several Taurus guns that did a very good job. For a decent price, you get a very nice revolver with good sights, great grips, tight lockup and a lifetime warranty. If you are looking to buy a four-inch .357 to carry for general use without breaking the bank, give this gun a look. 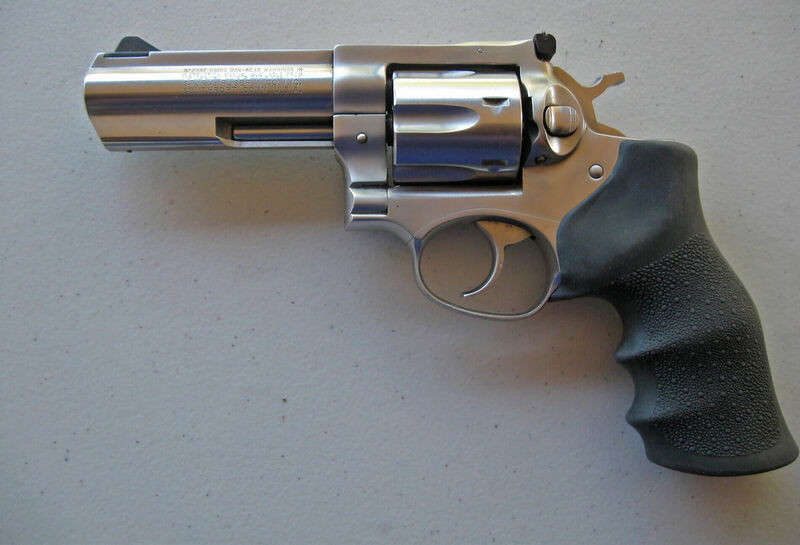 The Model 686 is one of Smith and Wesson’s stalwart revolvers in terms of sales. This gun is popular in its various barrel lengths – 2.5, 4, 6 and 8 ⅜ inches. The six inch variant is one of the most popular, as it is in the “Goldilocks” position – barrel not too long, not too short…just right. This is a hunter’s dream gun. You have a long-enough tube to generate some impressive velocities but yet not so long it bangs on things like trees or car doors. I have a longer-barreled revolver – I own an 8 ⅜ inch Model 629 .44 Magnum. Now there’s a barrel that likes to find anything in its general location and bounce off it as it rides on my belt. The shorter-barreled 686 doesn’t have this problem. I have a Rossi six-inch .357 that I’ve taken into the woods so I speak from experience. This is just a nice, all-around .357. The great thing about a .357 is that you can shoot .38 Special ammo as most of us know. Using a reduced, 38 Special-strength load I took a squirrel out of the top of a tall hickory tree with my six-inch .357 shooting offhand. That length barrel not only provides decent ballistics but it also helps with the sight radius – it spreads the front and rear sights a little further apart to yield a little more practical accuracy than would a four-inch model. And, accurate those guns are, “practical” or otherwise. The Model 686 is the stainless version of the 586. The 686 was introduced in 1981 and was based on the medium L frame (very similar to the K frame only just a little larger). Before what I call “The Great Migration” to semiautos among law enforcement occurred, the 4-inch 586 was pretty much the revolver of choice for police to carry. The stainless version, the model 686 that we are discussing, was introduced in 1988. The guns were popular until the mid-1980s when self-loading pistols became the rage and the 9mm started its inexorable climb to stardom. Savvy shooters, however, still carry the 686 whenever possible. It makes a great woods gun, as we have seen, but it also excels at home defense. When stoked with .38 Special +P ammo, it makes a good nightstand gun as those rounds tend not to penetrate as much as full-bore .357 rounds usually do. Or, take it back to the woods as you hike and load it with a couple of .38 Special shot loads if snakes are at the bottom of your fauna list. The point is that a six-inch .357 does most everything equally well and is a great choice for the only-can-afford-one-gun person. The excellent trigger and sights coupled with the incorporated benefits of over a century of ergonomic revolver design makes the Smith and Wesson 686 one of the best buys in the handgun world. After reviewing the ten .357 guns here, it makes me want to go out and buy two or three of them. You can’t argue the fact that the .357 is just about the most popular revolver cartridge out there. This statement comes from a guy who likes wheelgun calibers that begin with a “4”. I reload for all of the popular rimmed revolver cartridges. In spite of my affinity for the .45 Colt and .44 Special, I still stand by my statement that the .357 is one of the easiest and most versatile calibers to reload. From light target loads to deer-stompers, the .357 provides the shooter with whatever load they require. How do you decide which of these guns to buy? The answer is simple – what are you going to use it for? If you are going to carry it concealed, one of the short-barreled guns is in order. Hunting? 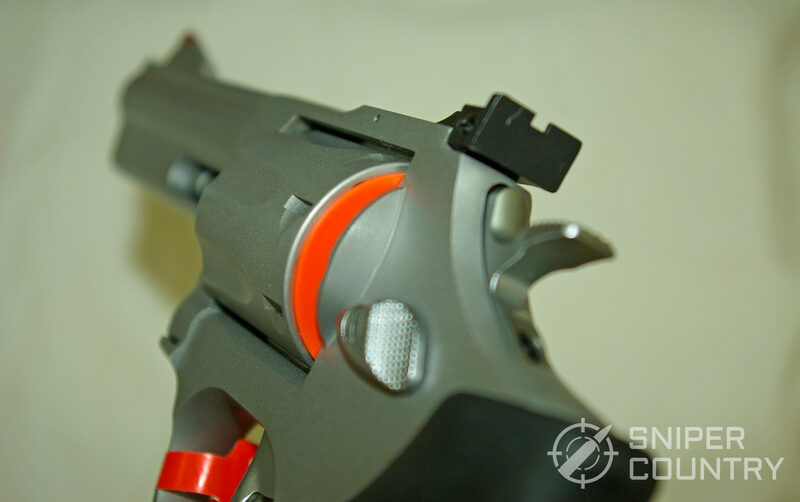 The six-inchers fit that niche very well with their longer sight radius and velocity boost. Hiking/general use? A four-incher is a perfect candidate for the title of most versatile .357. No matter what you need, there is a gun out there that will work for you…you just need to go find it. One thing about the .357 – you shouldn’t have any trouble finding one you like. There are a lot of them out there. It’s a great caliber. If you already shoot the .357, you know what I’m talking about. But if you’ve not shot one – isn’t it about time you did? It’s a really useful caliber, with some really great guns made for it. 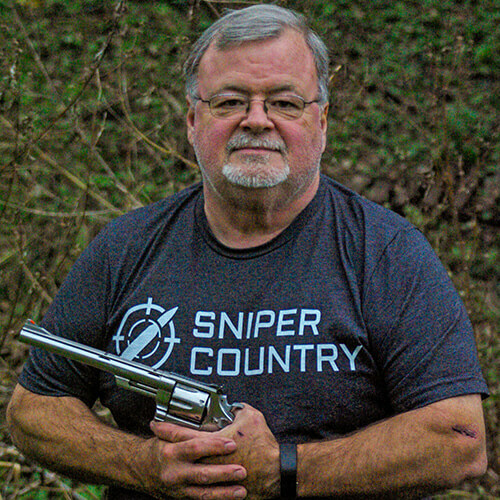 Mike has been a shooter, bullet caster and reloader for over 40 years. Never one to be satisfied with the status quo, he is often found at his reloading bench concocting yet another load. With a target range in his backyard and after 40 years of shooting, his knowledge of firearms and reloading is fairly extensive. He is married, with four sons and daughters-law and 8-and-counting grandkids.